The Bhagvadgita is perhaps the greatest work of practical Indian philosophy. 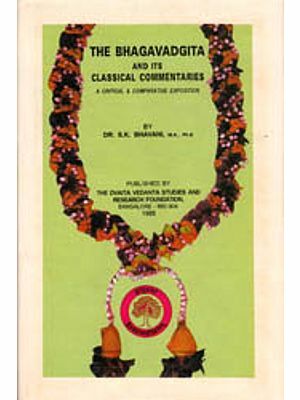 Among the various interpretations of the Bhagvadgita, the one by Mahatma Gandhi holds a unique position. 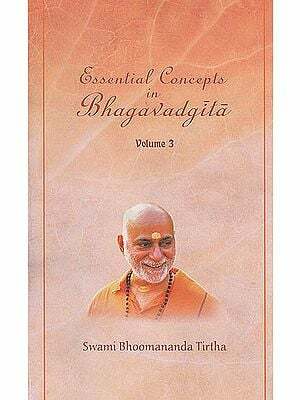 In his own words, his interpretation of the Bhagvadgita is designed for the common man - "who has little or no literary equipment, who has neither the time nor the desire to read the Gita in the original, and yet who stands in need of its support". Gandhi interpreted the Bhagvadgita, which he regarded as a gospel of selfless action, over a period of nine months from February 24th to November 27th, 1926 at Satyagrah Ashram, Ahmedabad. The morning prayer meetings were followed by his discourses and discussions on the Bhagvadgita. 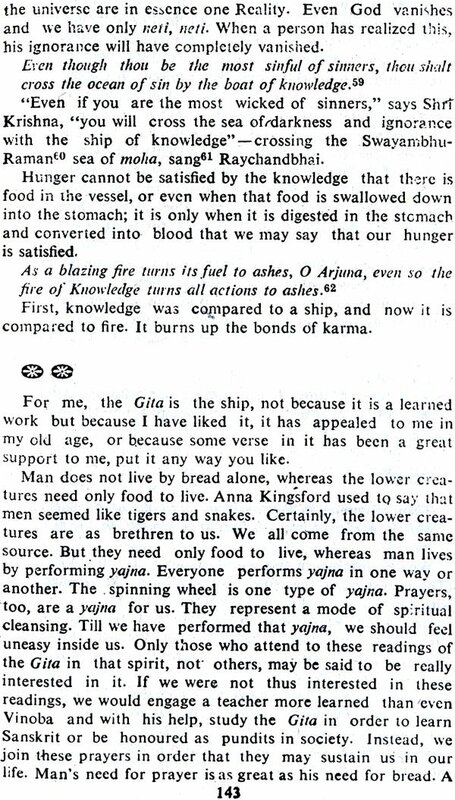 I became acquainted with the Gita in 1889. I was twenty years of age at that time. I had not yet fully understood the significance of non-violence as a principle of dharma. It was from Shamal Bhatt's couplet, "Let him offer water, and a good meal to eat," that I had first learnt the principle of winning over even an enemy with love. Its truth had made a deep appeal to my heart, but the couplet had not suggested to me the principle of compassion for all creatures. I had even eaten. meat before that time while I was still in India. I believed that it was one's duty to kill snakes and other such creatures. I remember having killed bed-bugs and other insects. I remember killing a scorpion once. Today I think that we should not kill even such poisonous creatures. In those days I believed that we would have to fit ourselves to fight the British. I used to murmur to myself the lines of the poem beginning, "Is it any wonder that the British rule over us?" My eating meat was for the purpose of fitting myself for this fighting in future. These were the views I held before I left for England. It was my desire to keep, even at the cost of my life, the promises which I had given to my mother that saved me from eating meat and other sins. My love of truth has saved me in many difficult situations. 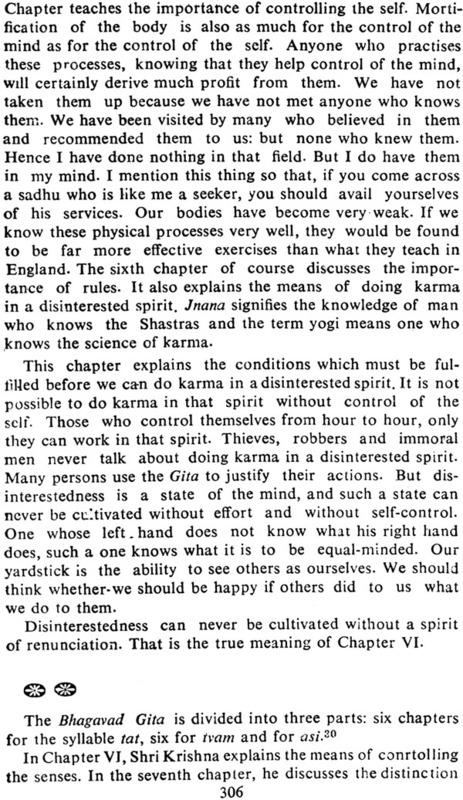 It was at this time 'that, coming into contact with two Englishmen, I was induced to read the Gita: I say "induced" because I had no particular desire to read it. When these two friends asked me to read the Gita with them, I felt rather ashamed. The consciousness that I knew nothing about our holy books made me feel miserable. The reason, I think, was my vanity. 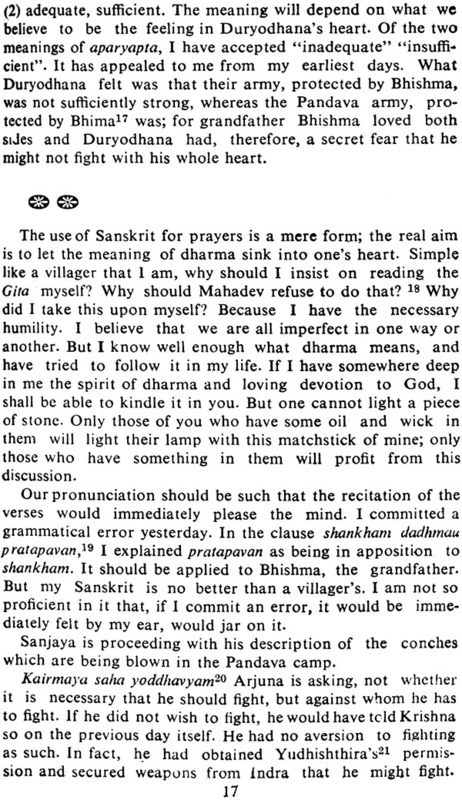 I did not know Sanskrit well enough to be able to read the Gita without help. 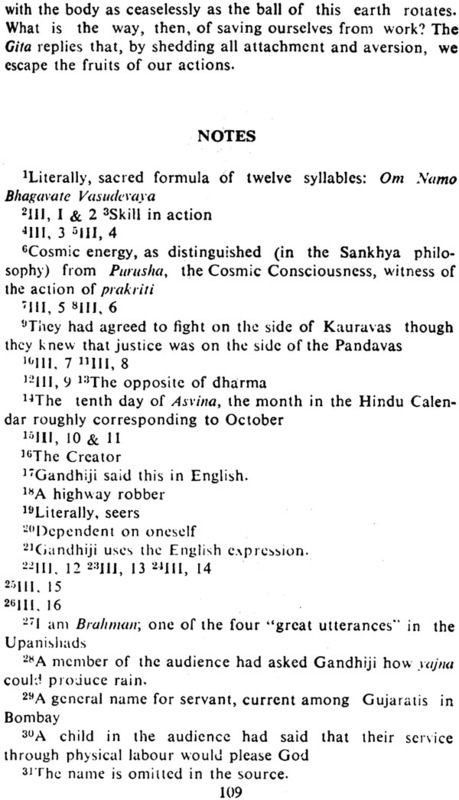 The two English friends, on their part, did not know Sanskrit at all. They gave me Sir Edwin Arnold's excellent translation of the poem. I went through the whole of it immediately and was fascinated by it. From that time till now, the last nineteen stanzas of Chapter II have ever remained engraved in my heart. For me, they contain the essence of dharma. They embody the highest knowledge. The principles enunciated in them are immutable. The intellect, too, is active in them in the highest degree, but it is intellect, disciplined to high purpose. The knowledge which they contain is the fruit of experience. This was my first introduction to the Gita. I, since then have read many other translations and commentaries and listened to many -discourses but the impression made by that first reading persists. These stanzas are the key to the under- standing of the Gita. I would even go so far as to advise people to reject statements in the poem which bear a meaning contrary to that of these nineteen stanzas. For a person who is humble there can be no question of rejecting anything. He will merely reason: "It is the imperfection of my own intellect that today other stanzas seem to me inconsistent with these. In the course of time, I shall be able to see their consistency." So he will tell himself and others, and leave the matter there. For understanding the meaning of Shastras, one must have a well-cultivated moral sensibility andexperience in the practice of their truths. The injunction against Sudras study- ing the Vedas is not altogether unjustified. A Sudra, in other words, a person without moral education, without sense and without knowledge, would completely misread the Shastras. No person, even if grown up in age, is qualified to under- stand difficult problems in algebra without preparation. Before anyone can understand such problems, he must have studied the elements of the subject. How would 'Aham Brah- masmi' sound in the mouth of a lustful man? What meaning, or distorted meaning, would he not attach to it? Hence, anyone who offers to interpret the Shastras must have observed the prescribed disciplines in his life. A mecha- nical observance of these disciplines is as futile as it is diffi- cult. The Shastras regard it essential that one should have a guru. But gurus are rare in this age and, therefore, wise men of learning advise regular study of books in regional langu- ages which are steeped in the spirit of devotion. 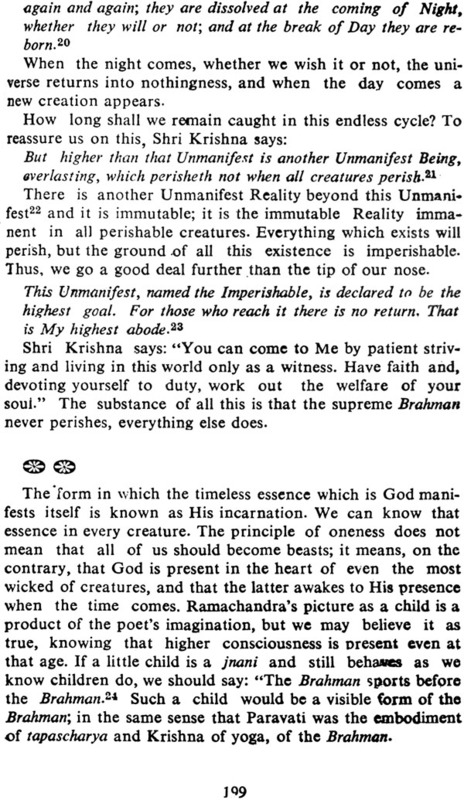 Those, however, who are devoid of this spirit and lack even faith, are not qualified to explain the meaning of the Shastras. Learned men may please themselves and draw seemingly profound meaning from the Shastras, but what they offer is not the real sense of these. Only those who have experience in the practice of their truths can explain the real meaning of the Shastras. There are, however, principles for the guidance of the common man too. Any interpretation of a Shastra which is opposed to truth cannot be right. The Shastras are not meant for those who question the validity of the principle of truth itself, or, rather, the Shastras are no better than or- dinary books for such a person. No one can meet him in argument. Anyone, on the other hand, who does not find the principle of non-violence in the Shastras is indeed in danger, but his case is not hopeless. Truth is a positive value, while non-violence is a negative value. Truth affirms. Non- violence forbids something which is real enough. Truth exists, untruth does not exist. Violence exists, non-violence does not. Even so, the highest dharma for us is that nothing but non-violence can be. Truth is its own proof. and non-vio- lence is its supreme fruit. The latter is necessarily contained in the former. Since, however, it is not evident as truth is, one may try to discover the meaning of the Shastras without believing in it. But the spirit of non-violence alone will reveal to one the true meaning of the Shastras. 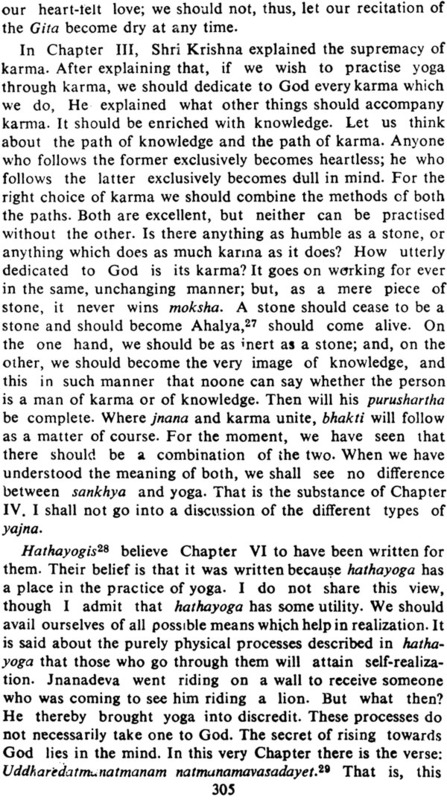 Tapascharya is certainly necessary for the realization of truth. Some sage who had realized truth revealed to the world the goddess of non-violence from amidst the prevailing violence, and said: "Violence comes of illusion; it avails not . .Non-violence .alone is true." Without non-violence, it is not possible to realize truth. The vows of brahmacharya, non- stealing and non-possession are of importance for the sake of non-violence, they help one to realize it in oneself. It is the life-breath of truth. Without it, man is a beast. The seeker after truth will discover all this very early in his 'quest, and then he will have no difficulty at any time in understand- ing the meaning of Shastras. The second rule to be followed in determining the mean- ing of a text in a Shastra is that one should not stick to its letter, but try to understand its spirit, its meaning in the total context. Tulsidas's Ramayana is one of the greatest works because its spirit is that of purity, compassion and devotion to God. An evil fate awaits one who beats his wife because Tulsidas has said in his work: that a Sudra, a dull- witted person, a beast and a woman merit chastisement. Rama not only never raised his hand against Sita, he did not even displease her at any time. Tulsidas merely stated a common belief. He could never have thought that there would be brutes who might beat their wives and justify their action by reference to his verse. Maybe Tulsidas himself, following the practice of his time, used to beat his wife; what even then? The practice does not cease to be reprehensible. In any case, his Ramayana was not composed to justify men beating their wives. It was composed to display the character of a perfect man, to tell us about Sita, the noblest among chaste and devoted wives, and to delineate the ideal devotion of Bharat. The support which the work seems to lend to evil customs should be ignored. Tulsidas did not compose his priceless work to teach geography. We should, there- fore, reject any erroneous statements of a geographical character which we may find in it. 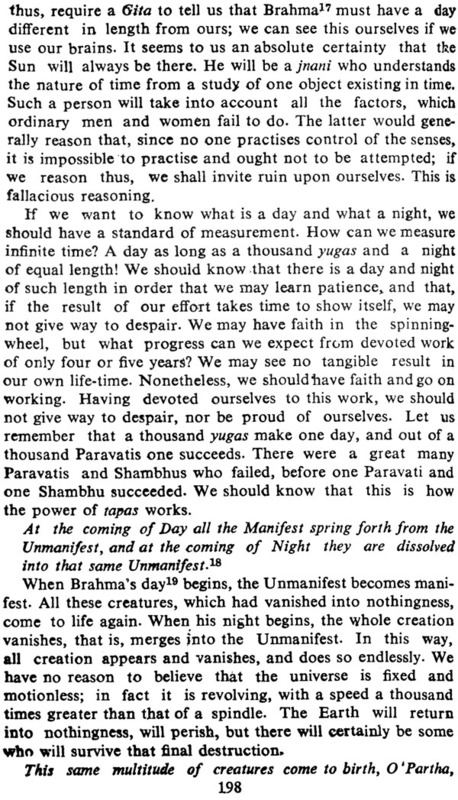 Let us now examine the Gita, Its subject-matter is simply the realization of Brahman and the means thereto; the battle is only the occasion for its teaching. One can say, if one likes, that the poet used it as an occasion because he did not look upon was as morally wrong. On reading the Mahabharata I formed quite a different impression. Vyasa wrote his supre- mely beautiful epic to depict the futility of war. What did the Kauravas' defeat and the Pandavas' victory avail? How many among the victors survived? What was their fate? What was the end of Kunti, mother of the•Pandavas? What trace is left today of the Yadava race? Since the Gita's subject is not description of the battle and justification of violence, it is perfectly wrong to give much importance to these. 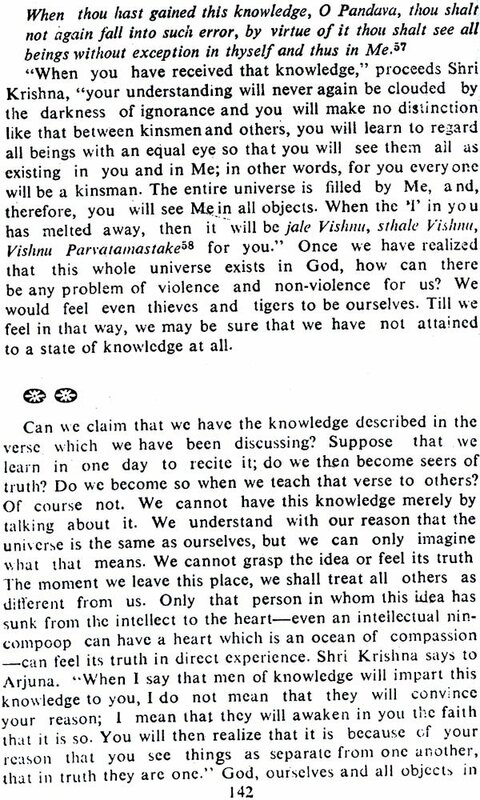 If, moreover, it is difficult to reconcile a few of the verses with the idea that the Gita advocates non- violence, it is still more difficult to reconcile the teaching of the work as a whole with the advocacy of violence. When a poet composes his work, he does not have a clear conception of all its possible implications. It is the very beauty of a good poem that it is greater than its author. The truth which a poet utters in his moment of inspiration, we do not often see him following in his own life. Hence the lives of many poets are at variance with the teaching of their poems. That the overall teaching of the Gita is not violence but non-violence is evident from the argument which begins in Chapter II and ends in Chapter XVIII. The intervening chapters propound the same theme. Violence is simply not possible unless one is driven by anger, by ignorant love and by hatred. 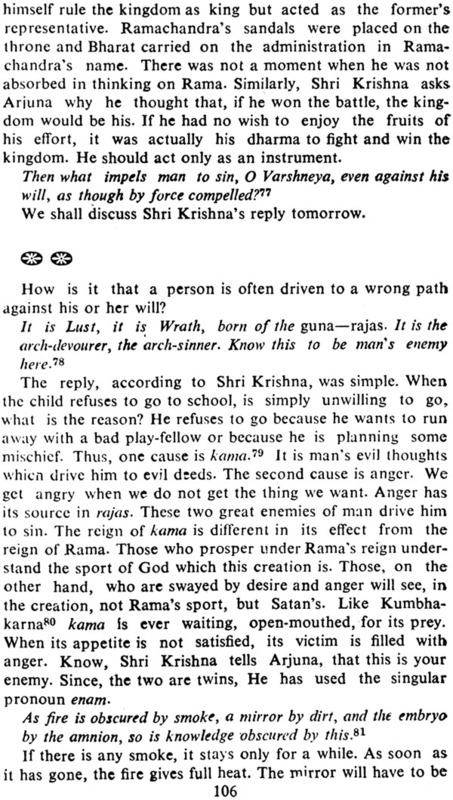 The Gita, on the other hand, wants us to be incapable of anger and attain to a state un- affected by the three gunas. Such a person can never feel anger. I see even now the red eyes of Arjuna every time he aimed an arrow from his bow, drawing the string as far as his ear. 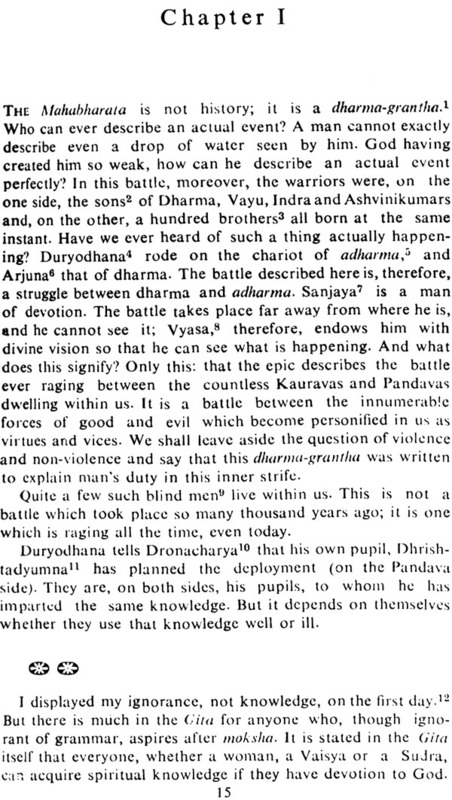 But, then, had Arjuna's obstinate refusal to fight anything to do with non-violence? In fact, he had fought often enough in the Past. On the present occasion, his reason was suddenly clouded by ignorant attachment. He did not• wish to kill his kinsmen. He did not say that he would not kill anyone even if he believed that person to be wicked. Shri Krishna is the Lord dwelling in everyone's heart. He understands the momentary darkening of Arjuna's reason. He, therefore, tells him: "You have already committed violence. By talking now like a wise man, you will not learn non-violence. Having started on this course, you must finish the job." If a passenger travelling in a train which is running at a speed of forty miles an hour suddenly feels aversion to travelling and jumps out of the train, he will have but committed suicide. He has not in truth realized the futility of travelling as such or of travelling by train. Arjuna was in a similar condition. Krishna, who believed in non-violence, could not have given Arjuna any advice other than what he did. 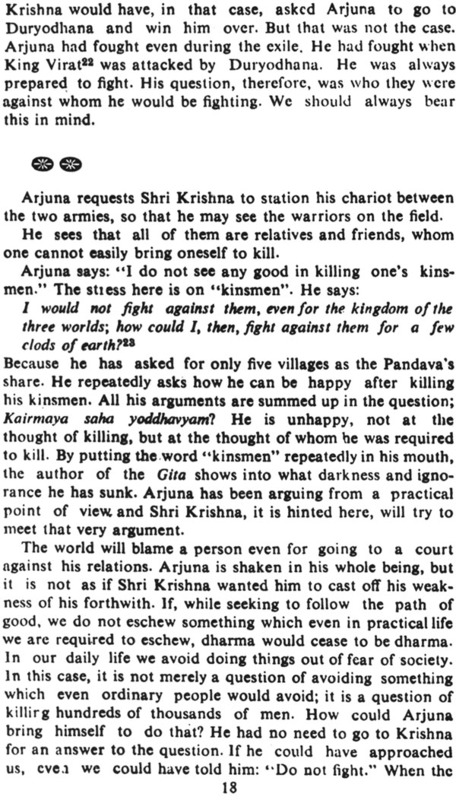 But to conclude from this that the Gita teaches violence or justifies war is as unwarranted as to argue that, since violence in some form or other is inescapable for maintaining the body in existence, dharma lies only in violence. -The man of discriminating intel- lect, on the other hand, teaches the duty of striving for deliverance from this body which exists through violence, the duty, that is, of striving for moksha. But whom does Dhritarashtra represent, and likewise Duryodhana, Yudhishthira or Arjuna? Whom does Krishna represent? Were they historical personages? 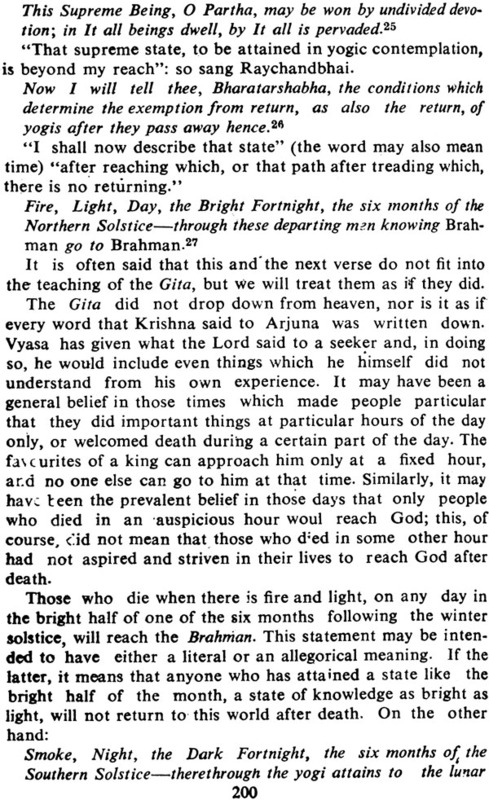 Does the Gita relate their actual doings? 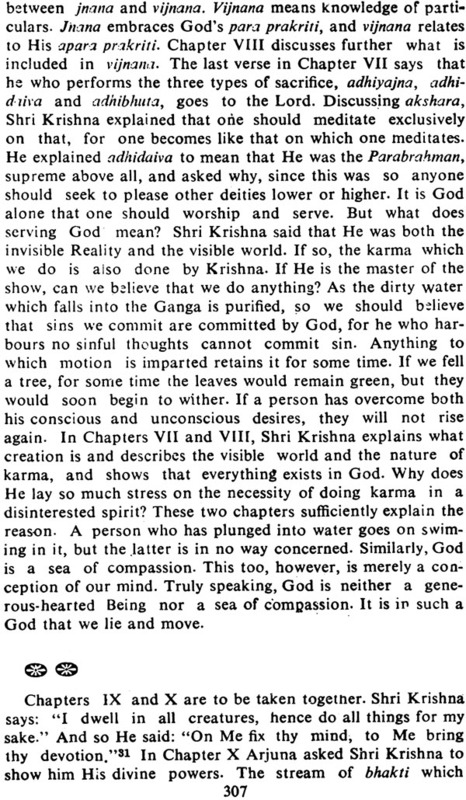 Is it likely that Arjuna should suddenly, without warning, ask a question when the battle was about to commence, and that Krishna should recite the whole Gila in reply? And then, Arjuna, who had said that his ignorance had been dispelled, forgets what he was taught in the Gita, and Krishna is made to repeat his teaching in the Anugita. 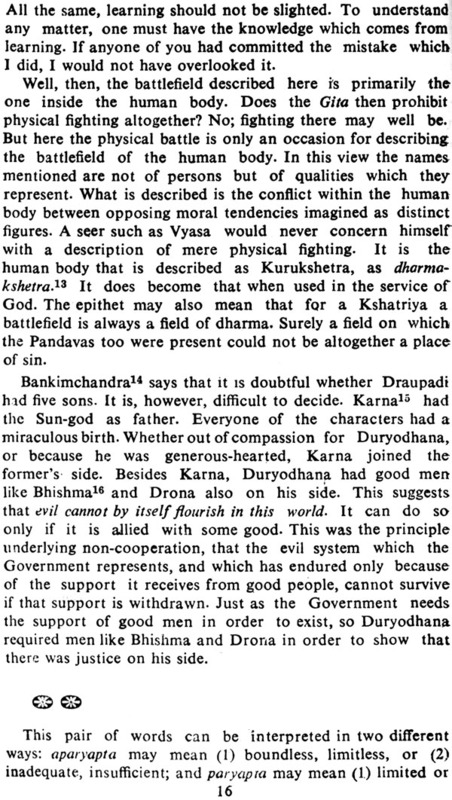 Personally, I believe that Duryodhana and his supporters stand for the Satanic impulses in us, and Arjuna and others stand for Godward impulses. The battlefield is our body. The poet-seer, who knows from experience the problems of like, has given a faithful account of the conflict which is eternally going on within us. Shri Krishna is the Lord dwelling in everyone's heart who is ever murmuring His promptings in a pure chitta like a clock ticking in a room. If the clock of the chitta is not wound up with the key of self-purification, the in-dwelling Lord no doubt remains where He is, but the ticking is heard no more. 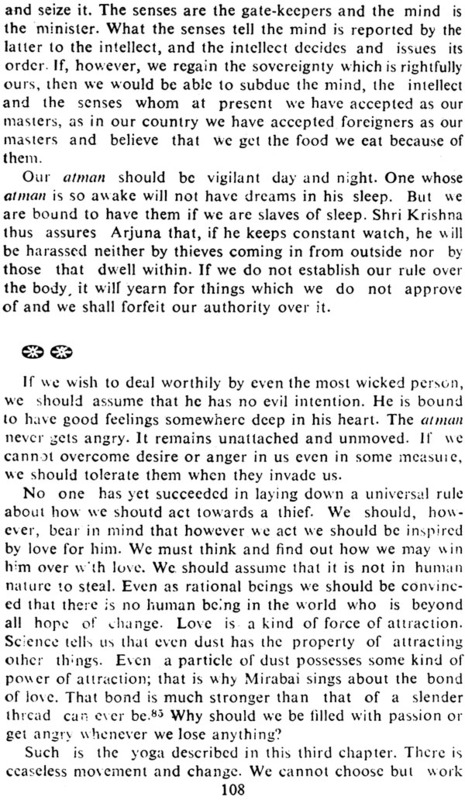 I do not wish to suggest that violence has no place at all in the teaching of the Gita. The dharma which it teaches docs not mean that a person who has not yet awakened to the truth of non-violence may act like a coward. Anyone who fears others, accumulates possessions and indulges in sense-pleasures will certainly fight with violent means, but violence does not, for that reason, become justified as his dharma. There is only one dharma. Non-violence means moksha, and moksha means realizing Satyanarayana. But this dharma does not under any circumstances countenance runn- ing away in fear. In this world which baffles our reason, vio- lence there will then always be. The Gita shows the way which will lead us out of it, but it also says that we cannot escape it simply by running away from it like cowards. Anyone who prepares to run away would do better, instead, to kill and be killed. 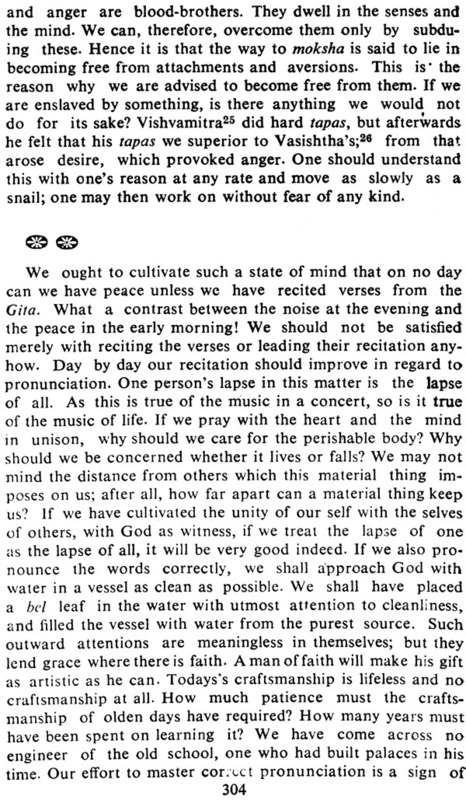 If the verses cited by the correspondent cannot be under- stood even after this explanation, I cannot explain them. I am sure no one.doubts that God, who is omnipotent, is, and must be, the Creator, the Preserver and the Destroyer of the Universe. He who creates has certainly the right to destroy. Even so, He does not kill, for He docs nothing. God is so merciful He does not violate the law that every creature that is born will die one day. If He were to follow His fancies and whims, where should we be? 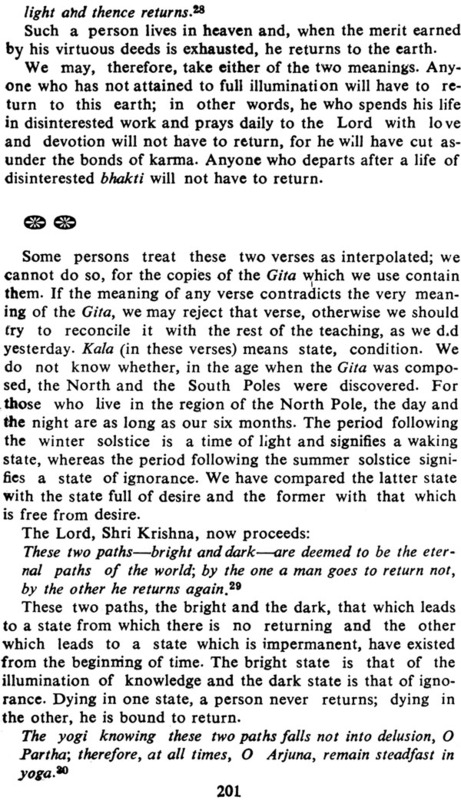 "The Gita is not a historical discourse. It is the description not of war between cousins, but between the two natures in us - the Good and the Evil. The deeper you dive into it, the richer the meaning you get. It being for the people at large, there is pleasing repetition. With every age (its) important words will carry new and deeper meaning." generations to come will scarce believe that such a one as this eve in flesh and blood walked upon this earth." "In the evolution of civilization, if it is to survive, all men cannot fail eventually to adopt his beliefs. "